Dravo Mechling, the barge line subsidiary of Dravo Corporation, recently announced a series of management changes related to its operations in the New Or- leans-Baton Rouge, La., area. Tom Terrell has been appointed manager, Southern operations. Reporting to Mr. Terrell will be Phil Payton. In addition to his current responsibilities as super- intendent of barge repair and fleeting in New Orleans, Mr.
Rouge. In that capacity he will be responsible for all fleet oper- ations in the Baton Rouge area. Martyn was commodity manager, grain, in Dravo Mechling's Pitts- burgh office. Loyd Murphy has been named barge repair and maintenance superintendent, Baton Rouge. His responsibilities will include all repair and maintenance activities and related personnel and inven- tories in the Baton Rouge area. Belgium, Holland, Italy, and Ger- many. Stork Services joins 16 other agencies and distributors around the globe providing local support for FAST marine and offshore sewage treatment systems. New Orleans, La., and unani- mously elected officers for the coming year. A new, high speed, lightweight, durable commuter boat has been developed by Luther Blount, President of Blount Marine. This latest patented design will soon be ferrying passengers between Bay Shore, Long island and Fire island at 30 mph. Special Construction - The 75 by 21 foot boat combines aluminum with high-buoyancy foam and fiberglass. Shallow Draft - Total draft is only 26 inches. Lightweight - Weight with twin CM 12V71 diesels is only 22 tons. Economy — Can be built and operated cheaper and faster than conventional vessels. 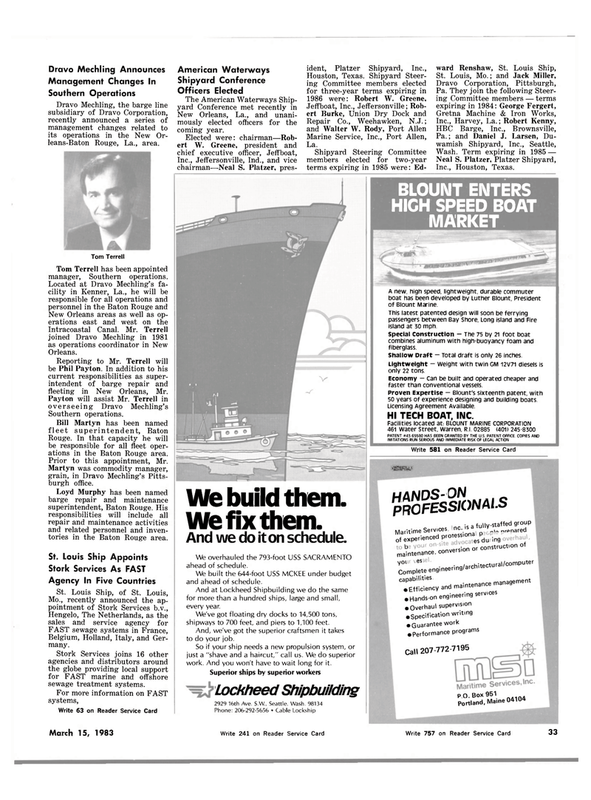 Proven Expertise - Blount's sixteenth patent, with 50 years of experience designing and building boats. And we do it on schedule. We overhauled the 793-foot USS SACRAMENTO ahead of schedule. We built the 644-foot USS MCKEE under budget and ahead of schedule. And at Lockheed Shipbuilding we do the same for more than a hundred ships, large and small, every year. We've got floating dry docks to 14,500 tons, shipways to 700 feet, and piers to 1,100 feet. And, we've got the superior craftsmen it takes to do your job. So if your ship needs a new propulsion system, or just a "shave and a haircut," call us. We do superior work. And you won't have to wait long for it.